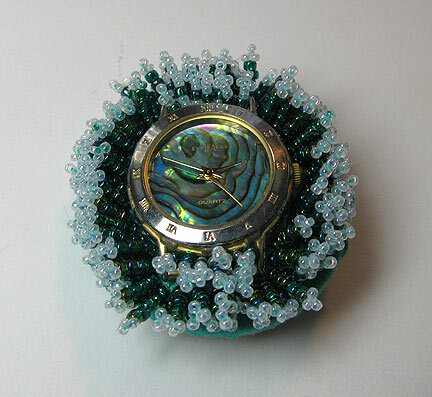 I'm making a series of covered buttons with watch faces for the Bead Journal Project this year. I still haven't decided whether they are going to be kept as buttons, used as individual cabochons in a larger piece, or stitched together in some way. No matter for now...I'm having fun. We've had a lot of crazy weather in New England this winter. A little over a week ago, the temperature went up to 60-some degrees and I sat out on our porch, surrounding by shrinking snowdrifts and melting icicles. A day later, it snowed again. I know the grass is under there somewhere, so I stitched it, topped by fluffy snow! I love this!!! You captured the hidden grass so well...reminding me so of the long Michigan winters where it lay hidden for months. I love these buttons....it's on my list of things I want to learn to do! Just got to your bead soup so I thought I would look at some of your other posts. You have done some beautiful work. 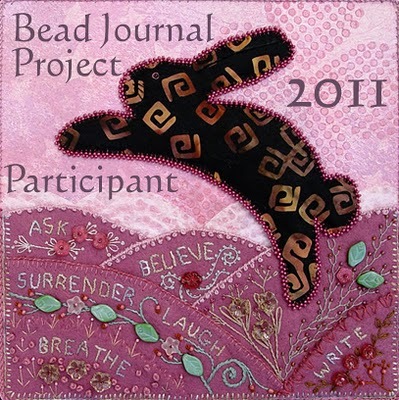 I am just getting started with bead embroidery... you have my heart fluttering to get busy! Very cool - I love the technique you used to get the snow covered grass. Gorgeous and I love the story of what inspired you. It reminds me of sea foam.